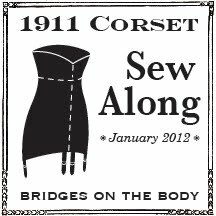 The 1911 corset sew along starts today! Eight weeks from now we'll have the perfect foundation garment for those most elegant Titanic era dresses and gowns. Your comments and suggestions have always been a great help to me while patterning, fitting, and constructing corsets and I'm thrilled there is a group of us working on the same corset together. It's motivating! I look forward to seeing everyone's work at the flickr group. If you haven't joined yet please do. Not only can you post images of your progress, you can ask questions and give feedback to other sew alongers. We have all levels of experience from novice to expert and I'm counting on your enthusiastic participation to make this sew along a success! Today, in addition to our patterns, we'll need extra paper, a ruler, tape, scissors or and x-acto knife, and a pencil. Before we start slashing and spreading the corset pattern pieces we need to figure out the waist reduction. Subtract 2 to 3 inches from your natural waist measurement. I wouldn't deduct more than that though, the silhouette of this era is moving away from the small waist/full hip of the S bend corset to a longer, slimmer line, so a tiny waist is not really the goal. Divide your reduced waist measurement by 2, since the pattern is for half of the corset. Now measure the waistline of your pattern. Chances are the reduced waist is larger than the pattern. You'll need to add to each panel to reach the desired number. If you are using the post Edwardian pattern divide the difference by 5, because that is how many pieces you have to distribute the difference between, if your are using the Corsets and Crinolines pattern divide it by 4. The resulting number is how much you'll add to each piece. For example, say your natural waist is 30 inches and your reduced waist is 27 inches and you're using the post Edwardian pattern. Divide 27 in half, you get 13 1/2 inches. Compare it the waist of the pattern, which is 11 1/2 inches, so a 2 inch difference. That means you'll distribute those 2 inches between all 5 pieces, so divide 2 inches by 5. That's roughly 3/8 per pattern piece. Make sense? Here's a formula for you to plug you own numbers into. OK, here we go! The very first thing we'll do is number the pieces from left to right. If this is your first corset the pieces can look similar, marking them now will help eliminate confusion later. Next, mark a point on the center front 6 1/2 inches below the waist, and 9 inches below the waist. Draw a line straight across to the center back of the pattern. If your using the Corsets and Crinolines pattern you'll need to draw a straight line across starting at the center front waist too. Don't worry that the actual waistline on the pattern doesn't not run straight across. These lines will help us keep the pieces oriented as we split them apart. Double check that both the center front and center back are perpendicular to those lines we just drew across the hips and waist. Sometimes through enlarging and taping pages together those lines can go a bit off so just straighten them now if they did. Line your ruler up so it crosses these two lines and draw a line through the center of each piece. We've just drawn in the grain line. We'll use this line when we're placing the pattern pieces on the fabric, and also as a straight line for slashing the pattern pieces. Now cut the first piece on that line. Slide a piece of paper under one side of your pattern piece and spread the other side apart using the z amount you arrived at in your calculation. To make certain the two halves are aligned extend those horizontal lines you drew at the waist and hips. Then you can just line the piece up. Slash and spread one piece at a time and tape it in place before continuing with the next piece. If you're using the Corsets and Crinolines pattern go ahead and slash and spread the two hips gores too. When you're done you should have something that looks like this. Instead of spreading the pieces apart, you'll overlap them. Whew. That's all we need to worry about for today. We'll finish drafting the seam lines Wednesday. For those of you patterning for the first time, congratulations! You've delved into the world of drafting. Hooray! You didn't mention anything about taking into account the inches for a gap in the lacing. I know it is a personal choice to leave a gap or not - what do you usually do? I usually take three inches off my natural waist measurement and am done with it. Then usually there will be a 1 1/2 to 2 inch gap at the lacing anyway. Also, the panels with the lacing on both pattern can be trimmed down if it turns out they meet. The figuring of the lacing gap can get confusing. I do find with a gape it's easier to lace, but it seems to works better to sew the seams just a hair to the snug side and watch all those fractions of an inch reduce that extra bit. I've come up with a really awkward number to have to add to each piece (.694" to be precise!). I'll round it up to .7" to make it easier, but that still doesn't make it easy... How do I add .35" to each side? I don't even know how to measure that out. Any suggestions you can give me to figure out will be great! I don't know if this matters, but my friend enlarged the pattern in a graphics program, and the pattern waist actually measures about 22.5" instead of 23". I'd change that .35 to 5/16." It will be close enough. That's interesting about the 22.5 versus 23. Who knows why that is. It's not a make or break thing though, it still will need to be slashed and spread until the waist size matches what you need. I hope this helps! Such a quick response! Thank you, that is very helpful! I'm terrible at math. I can't exactly remember how my Internet surfing led me to your blog, but I'm so happy it did! I've never sewn anything before and I'm really excited to try this! Do you think you'll ever post pictures of the very first corsets you made back in 2004/2005? I don't have a picture of my very first one, but I should dig up images of some of early ones. Good idea. I understand why you spread the 4 main pieces of the Corsets and Crinolines pattern, but please could you explain why you spread the hip gores as well? Won't that make the pattern too big on the hips, because you are adding 6 times the amount you need to add, instead of 4? Good question. It's always easier to pinch out excess when fitting the mock than it is to split seams. Plus expanding the gores will be the first thing done if extra width is needed so it seemed simplest to just do it all at once. .... But where do our 6,5 inch and 9 inch below waist measurements join the party...? Wednesday? You've got it Marjorane, those hip measurements will be dealt with later. Ico-Anubis, as long as those pieces stick together what ever works! I'm using centimetres, how precise do I have to be when converting the inch measurements you've given to cms? For example when 6 1/2" is 16,51cm and 9" is 22,86cm. Can I use 16,5cm and 23cm? How do you calculate the center of each piece from which you draw your vertical line used to slash later on? These hare hardly even! You're right, they never seem to be even so I just I eyeball it. Not a stupid question at all. The top notch marks that all line up across all the pieces, that's the waistline. Rather than slash, spread and tape, I do this a bit differently. I transfer each pattern piece to tracing paper (which I buy by the roll). First I mark each pattern piece with a vertical line. (On Jo's corset pattern, the grain lines are perfect.) So for each pattern piece, I trace off one side. Then I slide the *tissue paper* over by the necessary amount and trace off the other side. I use the vertical line to be sure I've moved the tissue paper by the right amount. Then I true the top and bottom lines. Easy, neat, and saves on scotch tape. Ooh, that's a good technique. I'm going to have to try that!